A dreadful taxi experience and a hearty breakfast. Ho Chi Minh City or Saigon is my first destination in my Southeast Asian tour. It’s a foodie haven, that’s why it’s on the top of my list. So when Cebu Pacific had a promo flight to Saigon, my sister and I instantly grabbed it. After we spontaneously bought the tickets, we began our researches on Vietnam. Thus, the start of the love-hate relationship I have for Saigon. A few weeks after, I’ve read more than a hundred negative reviews of the city against a handful of positive reviews. Most tourists complained about the litter, the rip-offs, the scams and even stomach pains. By this time, I have a really low expectation of Saigon. On the day of our departure, you could say that I’m indifferent. The 1 hour delayed flight only added to my apprehension. Although when we landed in Tan Son Nhat International Airport, I felt a little enthusiastic. So I got my baggage, changed our Peso to Dong, and went outside to hail a cab. I’ve read a lot about the taxis who usually rip-offs foreigners, so my sister and I decided to keep our eyes on the meter. Our efforts are futile though. Because halfway on the trip, our meter is already running around 200,000VND ($10 or P405) and we’ve only been travelling less than 4 kilometers. We were already thinking of finding a new cab to take us to Pham Ngu Lao (the Backpackers Area) but it’s 2:30 in the morning so we grudgingly decided to stay. When we arrived in our hostel, the driver is asking us for 420,000VND + 75,000VND for his parking ticket in the airport! P1,000 for an 8-kilometer, 10-minute swift ride! This is INSANE!!! We got off the taxi, paid him only 400,000VND (P800) and walked out still feeling cheated! When we got into the hostel, my sister asked the receptionist how much the taxi from the airport should really cost and the receptionist told us it’s about 150,000VND ONLY. This is rock-bottom dissatisfaction. At 7:30 in the morning, with only 3 hours of sleep plus the events of the previous night, I was sort of dragging myself to get up. The only motivation I have is that my sister is up, and ready to explore the city. By 8, we were inquiring about the available tours around Saigon and the nearby towns. The staff in our hostel, Saigon Backpackers Hostel, is really friendly and helpful. In less than 15 minutes, we already booked a whole day Mekong Delta Tour for the next day and a half-day Cu Chi Tunnels Tour on the day after, both tours for only $18/person. After paying, the receptionist told us that we can get our free breakfast on the dining hall. Honestly, I was a little bit surprised. I had no idea that breakfast is in included even if we only booked the dorm room—and it only costs us $7/bed/night. He then showed us a short menu. We can choose either a Baguette with vegetables, egg or jam or instant noodles in different flavors and the fruit of the day. For the drinks, we have a choice of hot or iced Vietnamese Coffee, hot or iced tea or milk. P.S. 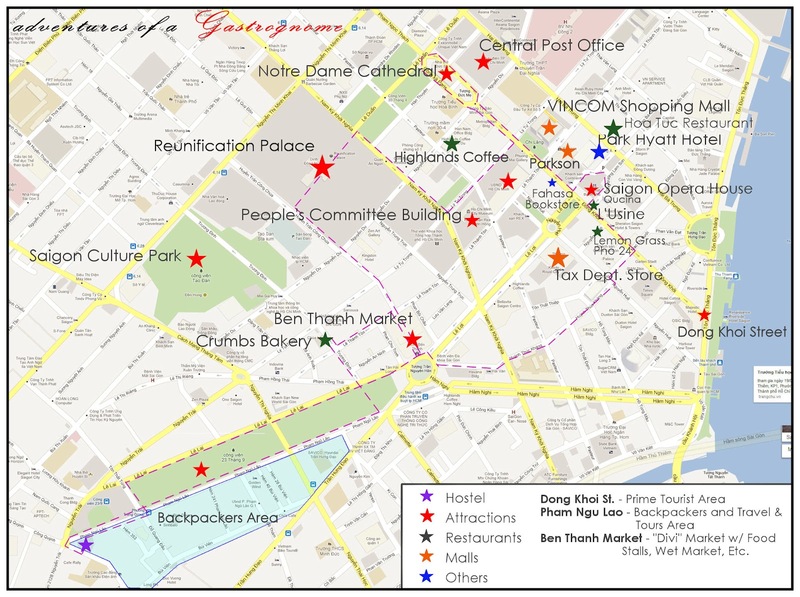 Tips on travelling around Saigon. * If you’re coming from the airport, it’s cheaper to pre-book a taxi from your hotel than get cheated. It will cost around 250,000VND—still cheaper than what that scumbag driver asked us. Or you can opt for the Taxi Coupon booth in the airport. * For the taxis, only trust Vinasun and Mailinh. Also ask for ‘meter on’ before climbing the cab. 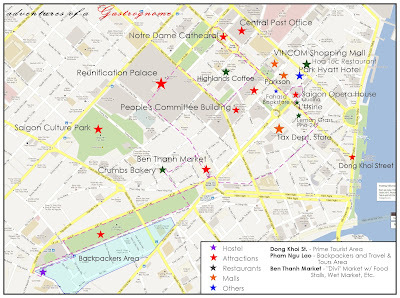 * Most of the tourist spots in Saigon are located in District 1. The destinations are in close proximity to one another that every place is within walking distance. Also, almost all streets in Saigon are lined with trees and the sidewalks are pretty wide. * There’s also no worrying about getting mugged because everywhere you go in District 1, you’ll see Security Personnel watching over the city. If you’re scared of crossing the streets because of the motos, you can always ask the Security or the Police to help you cross the street. * If you don’t want to walk but you also want to save money, then your best bet is the moto. It’s cheap—and yes, it’s safe. The Viets are one of the best moto drivers I’ve seen. Don’t worry about not finding them, they’re everywhere. * For an additional info, here’s a map of District 1. I’ve already put stars on the landmarks that are worth visiting. You can also download it if you want. Just click the photo to enlarge.